Lineage. Constituted as 33 Bombardment Squadron (Medium) on 22 Dec 1939. Activated on 1 Feb 1940. Redesignated as: 33 Bombardment Squadron, Heavy on 3 Feb 1944; 33 Bombardment Squadron, Very Heavy on 30 Apr 1946; 33 Bombardment Squadron, Medium on 28 Jul 1948. Discontinued and inactivated on 15 Mar 1963. 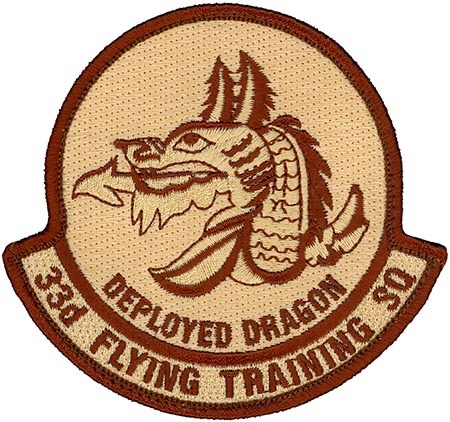 Redesignated as 33 Flying Training Squadron on 9 Feb 1990. Activated on 11 May 1990. Inactivated on 1 Oct 1992. Activated on 1 Oct 1998. Assignments. 22 Bombardment Group, 1 Feb 1940 (attached to 22 Bombardment Wing, 10 Feb 1951-15 Jun 1952); 22 Bombardment Wing, 16 Jun 1952-15 Mar 1963. 64 Flying Training Wing, 11 May 1990; 64 Operations Group, 15 Dec 1991-1 Oct 1992. 71 Operations Group, 1 Oct 1998-. Stations. Patterson Field, OH, 1 Feb 1940; Langley Field, VA, 16 Nov 1940; Muroc, CA, 9 Dec 1941-28 Jan 1942; Brisbane, Australia, 25 Feb 1942; Ipswich, Australia, 1 Mar 1942; Antil Plains, Australia, 7 Apr 1942; Woodstock, Australia, 20 Jul 1942; Iron Range, Australia, 29 Sep 1942; Woodstock, Australia, 4 Feb 1943; Dobodura, New Guinea, 15 Oct 1943; Nadzab, New Guinea, c. 10 Jan 1944 (air echelon at Charters Towers, Australia, 11 Jan-19 Feb 1944); Owi Island, New Guinea, 14 Aug 1944; Angaur, Palau Islands, 26 Nov 1944; Samar, Philippine Islands, 21 Jan 1945; Clark Field, Luzon, 12 Mar 1945; Okinawa, 15 Aug 1945; Ft William McKinley, Luzon, 23 Nov 1945; Kadena AB, Okinawa, 15 Jun 1946-c. 7 May 1948; Smoky Hill AFB, KS, 18 May 1948 (deployed at RAF Station Lakenheath, England, c. 16 Nov 1948-c. 14 Feb 1949); March AFB, CA, 10 May 1949-15 Mar 1963 (deployed at: RAF Station Lakenheath, England, 18 Nov 1949-16 Feb 1950; Kadena AB, Okinawa, 8 Jul-29 Oct 1950; RAF Station Wynton, England, 5 Sep-9 Dec 1951; RAF Station Upper Heyford, England, 9 Dec 1953-5 Mar 1954). Reese AFB, TX, 11 May 1990-1 Oct 1992. Vance AFB, OK, 1 Oct 1998-. Aircraft. B-18, 1940-1941; B-26, 1941-1943; B-25, 1943-1944; B-24, 1944-1945; B-29, 1946-1952; B-47, 1953-1963. T-37, 1990-1992. T-37, 1998-2006. A-6, 2005-. Operations. Flew coastal defense and antisubmarine patrol from California, Dec 1941-Jan 1942. Combat in Southwest Pacific with B-26s, mainly against Japanese shipping, 5 Apr 1942-7 Jan 1943. Received a Distinguished Unit Citation (DUC) for its contribution to the allied campaign in Papua, especially on the Lae and Buna fronts. Transitioned to B-25s in 1943, then returned to combat, 7 Oct 1943-early Jan 1944. Received a second DUC for helping destroy enemy entrenchments blocking an Australian advance on 5 Nov 1943. Transitioned to B-24 heavy bombers and returned to combat against the Japanese up the island chain to the Philippines and other Western Pacific and Chinese coastal areas, 10 Mar 1944-July 1945. Combat B-29 bombing sorties over Korea, 13 Jul-21 Oct 1950. Conducted undergraduate pilot training for active Air Force, Air Force Reserve, and Air National Guard from 1990 to 1992 and since 1998. Campaign Streamers. World War II: Antisubmarine, American Theater; East Indies; Papua; Bismarck Archipelago; New Guinea; Leyte; Luzon; Southern Philippines; Western Pacific; Air Offensive, Japan; China Defensive; China Offensive; Air Combat, Asiatic-Pacific Theater; Antisubmarine, Asiatic-Pacific Theater. Korea: UN Defensive; UN Offensive. Decorations. Distinguished Unit Citations: Papua, 23 Jul 1942- Jan 1943; New Guinea, 5 Nov 1943. Air Force Outstanding Unit Awards: [1 Oct] 1998-30 Jun 1999; 1 Jul 1999-30 Jun 2000; 1 Jul 2000-30 Jun 2001; 1 Jul 2001-30 Jun 2003; 1 Jul 2003-30 Jun 2004; 1 Jul 2004-30 Jun 2005. Philippine Presidential Unit Citation (WWII). Republic of Korea Presidential Unit Citation: 10 Jul-24 Oct 1950. Emblem. Approved on 10 Apr 1941, modified on 21 Jul 1998.